The Cobbler Shoppe – Shoes, boots and clothing for the whole family. Bill the Cobbler stays busy saving lost soles, taking care of heels, and tying down loose tongues. He’d even dye for you--any color you want, that is. Seriously, the Cobbler repairs, resoles, and restores most any shoe or boot. He’s willing to tackle problems with many other types of leather items too. The Cobbler Shoppe itself is a mini department store in beautiful downtown Britt, Iowa. You can find a variety of men’s, women’s, and kid’s clothing and footwear; workwear; West Hancock high school apparel; and Iowa collegiate items (Cyclones, Hawkeyes, and Panthers). 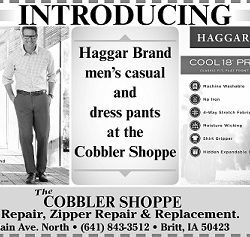 Other services provided by The Cobbler Shoppe include: zipper repair in clothing, minor alterations such as hemming and patching, and a drop off point for Premier Cleaners dry cleaning. Great selection of skechers, life stride, hush puppies and redwing shoes-boots! Ladies clothes and accessories, men’s dress shirts and polos, AND MORE! 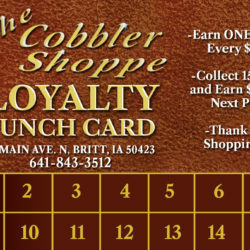 Ask for our new loyalty card: earn a reward for shopping local!